Ancient Works in Northern Ohio. 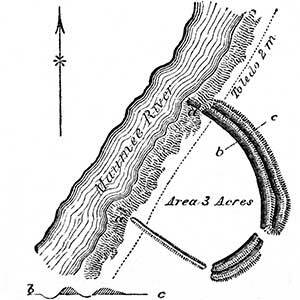 THE succeeding plans and descriptions, relating to aboriginal monuments of northern Ohio, were communicated by CHARLES WHITTLESEY, Esq., of Cleveland, whose archaeological researches have been both extensive and accurate. NUMBER I. Ancient Works near Norwalk, Huron county, Ohio.—"The relative positions of the various works composing this group are given by the eye; they are nevertheless sufficiently accurate. The individual works are laid down from actual survey. "The enclosure A is principally in a field long cultivated, and is scarcely traceable. The ditch is exterior to the wall, and exists only upon the north-west and south-west sides. The walls were very much reduced: when first seen by the whites, they scarcely exceeded eighteen inches in height. The ditch was of corresponding depth. "The work C occupies a corresponding position with those already described, as belonging to this group. The peninsula upon which it is situated is approachable only from the south. Upon this side the ditch is irregular. The mounds of the central group have been opened; but it is not known with what results. They are quite low, not exceeding three feet in height. The wall of this work is very slight. At the south-west is a graded passage to the lower level of the river bottom. "Huron river or creek, several branches of which join it at this point, is always fordable; and the bluffs which surround the enclosures are not very difficult of ascent. These works may have been designed for defence,—perhaps they were 'walled towns;' but they do not occupy positions of great natural strength. The grounds adjacent to the river are low, and in places swampy: the river evidently once ran at the base of the bluff occupied by the enclosure B." NUMBER 2. Ancient Work near Conneaut, Ashtabula county, Ohio.—"This work is at present very slight, but distinctly traceable. The sketch is a mere coup d'oeil, without measurements. The elevation of the bluff upon which it stands is about seventy feet; and the banks of aluminous slate are, upon the north, very precipitous. It would be entirely impracticable for a body of men to ascend upon this side, without ladders and scaling apparatus. Upon the south side it would be practicable for an assailant to ascend, unless prevented by some artificial obstacle. Upon this side, the wall which skirts the brow of the hill is accompanied by an outer ditch, while upon the north there is a simple embankment. The ascent, C C, is gradual and easy. Within the enclosure the earth is very black and rich; outside of the walls it is a stiff clay. The adjacent bottoms are very fertile, and the creek is everywhere fordable. There can be no doubt that this was a fortified position." Near the village of Conneaut are a number of mounds, and other traces of an ancient population, among which is an aboriginal cemetery regularly laid out, and of great extent. NUMBER 3. Ancient Work three miles south-east of Cleveland, Cuyahoga county, Ohio.—"This stronghold is on the great plain which extends some miles back from the shores of Lake Erie, gently declining towards it, and by many supposed to have been its ancient bed. Many portions of this plain are two hundred feet above the present surface of the lake. The marl, sand, and gravel deposits, of which this formation is made up, are from one hundred to three hundred feet thick. "These materials are readily washed away by rains, springs, and rivulets; so that the flat region is intersected by numberless deep and narrow ravines, leaving bluff headlands, and furnishing the ancient people with numerous positions protected on nearly every side by deep gullies and high precipitous banks, and capable, with little artificial aid, of easy defence. These features of the country, and the manner in which they were made available for defensive purposes, are well illustrated in the example here presented. The isthmus connecting this promontory with the general table is but about two hundred feet wide, and is defended by parallel lines of embankments accompanied by exterior ditches. There seems to be no gateway or opening through the outer line; the inner one, however, terminates before reaching the bank of the ravine on the left, leaving a narrow passage-way upon that side. The natural banks have an angle of forty-five to sixty degrees with the horizon, and are in many places wet and slippery, and utterly inaccessible. About one-fourth of a mile to the eastward of this work, is a mound ten feet high, by sixty feet in diameter at the base." FIG. 4.—This work is situated on the right bank of Black river, in Sheffield township, Lorain county, Ohio. The bank of the river is here nearly perpendicular and quite impossible of ascent, except by ropes or something equivalent, and is about sixty feet high. The water level of the lake reaches to this spot, and the river is in consequence too deep to be forded. The position seems to have been selected for the purpose of defence, although the land back of it is on the same level. "The artificial defences consist of double embankments, with an intermediate ditch. The embankments are very slight, not much exceeding a foot in height. It is not improbable that the ditch was occupied by wooden pickets, supported by embankments on either side. The work could not have afforded any protection, except with additional defences,—palisades, or something of the sort. Within the enclosure the soil is very rich; but without, it is clayey and poor. The gateway, opening to the north, is forty feet wide." FIG. 5.—This work is situated in the same township with that last described. 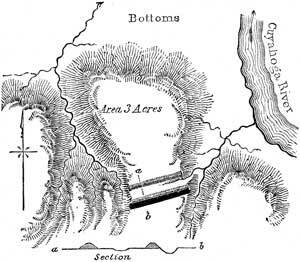 It is bounded upon three sides by a vertical slate bluff, and defended upon the fourth by a double line of embankments, with accompanying exterior ditches. The height of the walls is about eight feet, measuring from the bottom of the ditches. There is an opening or passage-way through the outer line, but none through the inner. We may account for this circumstance by supposing the latter to have been thrown up after the commencement of a siege. As usual, the soil within this work is very rich compared with that without the walls. Under any mode of attack known to barbarians, this must have been an impregnable work. Upon the other side of the creek, are bluffs of equal height with that upon which this defence is located; but they are too far distant to afford positions of annoyance to besiegers." FIG. 6.—This work is situated upon the Cuyahoga river, eight miles above Cleveland, Ohio. It corresponds, in all essential particulars, with the one on the same stream, five miles below, which has already been described. The ground has been so long under cultivation that the parallels are with difficulty traced; they are not more than a foot or eighteen inches high. The ditch is of corresponding depth. Between the lines there is a depression,—undoubtedly artificial in its origin, but now much deepened by rains. The soil is a clay-loam, and the area very difficult of access from all sides. The bluff is here from one hundred and fifty to two hundred feet high." FIG. 7.—This work is situated on the Cuyahoga river, two miles below that last described, with which it coincides in respect to position. It has, however, but a single wall and ditch; the latter is from two to four feet deep, the former of proportionate height. There is a gateway or unexcavated passage across the ditch, but no corresponding opening in the embankment. There is, however, a narrow, unprotected space between the left end of the defences and the bluff. The elevation of the ground is here about two hundred feet above the river, the soil sandy, and lately put under cultivation. The bluff is steep and difficult of ascent. Water is found in the adjacent ravines, which are narrow and deep." FIG. 8.—This work is situated on the right bank of the Maumee river, two miles above Toledo, in Wood county, Ohio. The water of the river is here deep and still, and of the lake level; the bluff is about thirty-five feet high. Since the work was built, the current has undermined a portion, and parts of the embankment are to be seen on the slips at a a. The country for miles in all directions is flat and wet, though heavily timbered, as is the space in and around this enclosure. The walls, measuring from the bottoms of the ditches, are from three to four feet high. They are not of uniform dimensions throughout their extent; and as there is no ditch on the south-west side, while there is a double wall and ditch elsewhere, it is presumable that the work was abandoned before it was finished." "Nothing can be more plain, than that most of the remains in northern Ohio, particularly those on the Cuyahoga river, are military works. There have not yet been found any remnants of timber in the walls; yet it is very safe to presume that palisades were planted on them, and that wooden posts and gates were erected at the passages left in the embankments and ditches. "All the positions are contiguous to water; and none of them have higher land in their vicinity, from which they might in any degree be commanded. Of the works bordering on the shore of Lake Erie, through the State of Ohio, there are none but may have been intended for defence; although in some of them the design is not perfectly manifest. 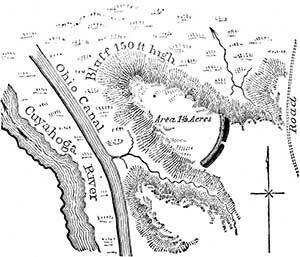 They form a line from Conneaut to Toledo, at a distance of from three to five miles from the lake; and all stand upon or near the principal rivers. There are probably five of them as yet unknown, to one that has been publicly noticed. In the interior of the State, so far as my observation has extended, this class of works is wanting. Their place is supplied by larger works, situated on low lands, their strength depending more on artifice than on position.29 They are so different, that I am disposed to regard them, not only as designed for other purposes, but as the work of another and probably later people. 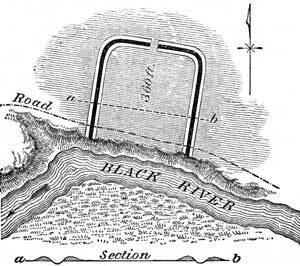 "The most natural inference in respect to the northern cordon of works is, that they formed a well-occupied line, constructed either to protect the advance of a nation landing from the lake and moving southward for conquest; or, a line of resistance for a people inhabiting these shores and pressed upon by their southern neighbors. The scarcity of mounds, the absence of pyramids of earth, which are so common on the Ohio, the want of rectangular and other regular works, at the north,—all these differences tend to the conclusion that the northern part of Ohio was occupied by a distinct people. "At the north there is generally more than one wall of earth, and the ditches are invariably exterior. There are sometimes passages, or 'sally-ports,' through the outer parallel, and none through the inner one. There is also, in general, a space between the parallels sufficiently large to contain a considerable body of fighting men. By whatever people these works were built, they were much engaged in offensive or defensive wars. At the south, on the other hand, agriculture and religion seem to have chiefly occupied the attention of the ancient people. "In view of the above facts, we may venture to suggest a hypothesis, without undertaking to assign to it any more than a basis of probability. Upon the assumption that two distinct nations occupied the State,—that the northern were warlike, and the southern peaceful and agricultural in their habits,—may we not suppose that the latter were overcome by their northern neighbors, who built the military works to be observed upon the Ohio and its tributaries, while the more regular structures are the remains of the conquered people?" 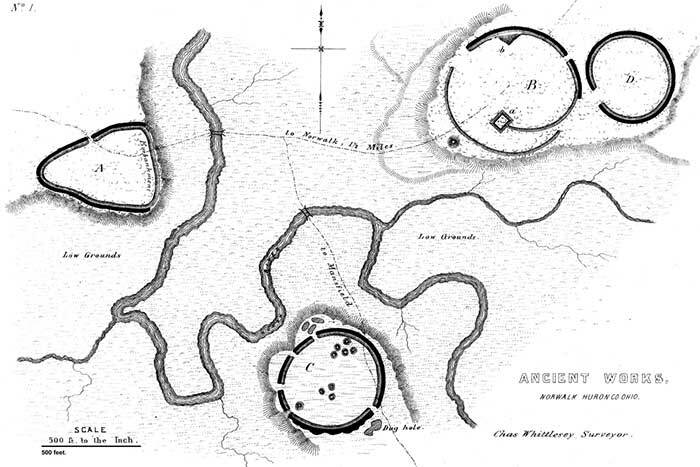 The differences between the northern and southern earthworks, pointed out by Mr. Whittlesey, are not greater than would naturally be exhibited between the structures of a sparse frontier population, and those erected by more central and dense communities. Works, generally corresponding with those here described, are found still further to the northward and eastward; extending to the Genesee river and its tributaries in New York, and even to the head waters of the Susquehanna in Pennsylvania,—which seems to have been the extreme limit to which the mound-builders penetrated in that direction. From plans previously presented, it will be seen that precisely analogous works occur in Kentucky and Tennessee. It will be seen also, in a succeeding chapter, on the "Antiquities of the Southern States," that similar structures are found in Mississippi, and elsewhere along the Gulf. The examples of defensive works here presented will serve to give a very accurate conception of this class of structures. By a minute attention to their various details, we are prepared to estimate the judgment, skill, and industry of their builders. No one can rise from such an examination, except with the conviction that the race, by whom these works were erected, possessed no inconsiderable knowledge of the science of defence,—a degree of knowledge much superior to that known to have been possessed by the hunter tribes of North America previous to the discovery by Columbus, or indeed subsequent to that event. Their number and magnitude must also impress the inquirer with enlarged notions of the power of the people commanding the means for their construction, and whose numbers required such extensive works for their protection. It is not impossible that, like the defensive enclosures of the Polynesian Islanders, they were to a certain extent designed to embrace cultivated fields, so as to furnish the means of subsistence to their defenders, in the event of a protracted siege. There is no other foundation, however, for this suggestion, than that furnished by the great size of some of them. The population that found shelter within their walls must have been exceedingly large, if their dimensions may be taken as the basis of a calculation. There is no positive evidence that the mound-builders fully understood the value of the bastion in their works of defence; although they seem, in some instances, to have secured the projecting points of the hills on which their defences are situated, with a view of enfilading the walls. 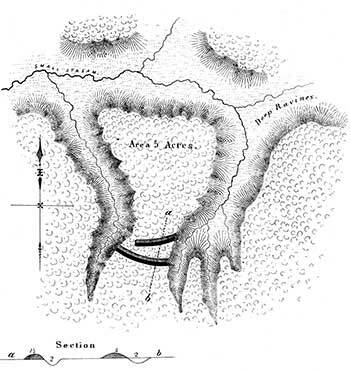 The fortified hill near the mouth of the Great Miami, (Plate IX,) and Fort Hill, in Highland county, afford examples. These projecting points could however, from their wide distance apart, but very imperfectly answer the purpose of bastions; and the supposition that they were thus used is rendered less probable, from the fact that the walls oftener cut off these points than accommodate themselves to them. It is not improbable, notwithstanding the absence of direct evidence to that effect, that bastions of wood were erected at intervals along the walls. Such constructions would undeniably be the most simple and efficient for the purposes desired. The numerous openings in the walls of many of these works, although indiscriminately denominated gateways, were clearly not always designed as such. It is not unwarrantable to suppose that they mark the positions of wooden constructions, like the block-houses of later times, which projected beyond the walls, and answered the double purpose of bastions and watch-towers. The very regular intervals between these openings, particularly in the great work on the Little Miami, (Plate VII,) and the Fortified Hill in Highland county, just mentioned, (Plate V,) would seem to favor this hypothesis. Of course we cannot now expect to find any traces of wooden structures, even if such entered into the original defences. The walls of earth and stone which constitute all that remains to us of these aboriginal fortifications, although often high and heavy, would nevertheless, in themselves, furnish very imperfect means of protection and resistance. Earth cannot be heaped up so as very much to impede an assailant; and the stone works, as far as noticed, do not appear to have been constructed of stone regularly laid, so as to present a vertical or inaccessible front to an enemy. These circumstances render it sufficiently obvious that the walls were surmounted by palisades, or by something equivalent. We are sustained in this conclusion by the concurrent practices of all nations, known to construct permanent works of this description. The ramparts of the Roman camps were strengthened by stakes fixed on the top; and to this day, the walls of E'Pas, or entrenched hills of the New Zealanders, are surmounted by palisades. Such also is the present practice of some of the tribes on the Missouri,—the Minatarees, Rickarees, and others. The walls of some works, which, from their position and other circumstances, are manifestly of defensive origin, are so slight that it would be absurd to suppose them designed for protection, unless crowned with palisades. Most of those of northern Ohio are subject to this remark. It has been asserted by certain writers on American antiquities, that traces of palisades are yet to be seen in some of them. Aside from the palpable improbability of anything of the sort, it is proper to remark that no such evidences have been observed in the course of our own investigations. A very few years of exposure would suffice to obliterate all traces of wood in these constructions. We have already had occasion to remark the skill with which the gateways or entrances to these enclosures are sometimes protected by over-lapping or concentric walls, horn-works, etc. It is rational to conclude that means were made use of by the builders to close the entrances effectually, when desired. How this object was accomplished is, of course, entirely a matter of conjecture. The Australians, in case of alarm, completely close their entrenchments with stones or other obstructions. Entrance is effected only by a succession of posts of different lengths, like a stile, or by the aid of notched trees. In connection with many of the defensive structures, mounds are occasionally to be found, so placed as to suggest the purposes of watch-towers, look-outs, or alarm-posts. They are sometimes exterior, and sometimes interior to the walls of the enclosures, and occasionally incorporated with them. Plate XI (Nos. 1 and 3) affords examples. It is possible that this was not the primary, perhaps not even the secondary purpose of these mounds. Proper excavations would settle the question. In the absence of these, we can only appeal to such light as analogy affords us in our inquiry. Such mounds were erected by the ancient Britons for purposes of observation, both in advance of their other defences and within them; and the early Spanish writers speak of similar erections, for similar purposes, by the Floridian Indians. The New Zealanders compass the same ends by raising a tree, the branches of which have been lopped off within a few inches of the trunk, at some elevated point within their works. The almost invariable presence of water within, or in immediate proximity to these enclosures, has been the occasion of frequent remark in the foregoing descriptions. In the absence of springs and streams, as also where, from position, access to such supplies of water is impracticable, we find their place supplied by reservoirs; an evidence of the forethought of the builders, as also an index to the true character of the works in which these features occur. The vast amount of labor necessary to the erection of most of these works precludes the notion that they were hastily constructed to check a single or unexpected invasion. 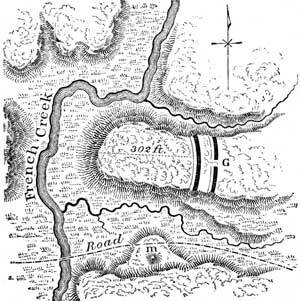 On the contrary, there seems to have existed a System of Defences extending from the sources of the Alleghany and Susquehanna in New York, diagonally across the country, through central and northern Ohio, to the Wabash. Within this range, the works which are regarded as defensive are largest and most numerous. If an inference may be drawn from this fact, it is that the pressure of hostilities was from the north-east; or that, if the tide of migration flowed from the south, it received its final check upon this line. On the other hypothesis, that in this region originated a semi-civilization which subsequently spread southward, constantly developing itself in its progress, until it attained its height in Mexico, we may suppose that from this direction came the hostile savage hordes, before whose incessant attacks the less warlike mound-builders gradually receded, or beneath whose exterminating cruelty those who occupied this frontier entirely disappeared, leaving these monuments alone to attest their existence, and the extraordinary skill with which they defended their altars and their homes. Upon either assumption, it is clear that the contest was a protracted one, and that the race of the mounds were for a long period constantly exposed to attack.30 This conclusion finds its support in the fact that, in the vicinity of those localities, where, from the amount of remains, it appears the ancient population was most dense, we almost invariably find one or more works of a defensive character, furnishing ready places of resort in times of danger. We may suppose that a condition of things prevailed somewhat analogous to that which attended the advance of our pioneer population, when every settlement had its little fort, to which the people flocked in case of alarm or attack. It may be suggested that there existed among the mound-builders a state of society something like that which prevailed among the Indians; that each tribe had its separate seat, maintaining, with its own independence, an almost constant warfare against its neighbors, and, as a consequence, possessing its own "castle," as a place of final resort when invaded by a powerful foe. Apart from the fact, however, that the Indians were hunters averse to labor, and not known to have constructed any works approaching in skilfulness of design or in magnitude those under notice, there is almost positive evidence that the mound-builders were an agricultural people, considerably advanced in the arts, possessing a great uniformity throughout the whole territory which they occupied, in manners, habits, and religion,—a uniformity sufficiently well marked to identify them as a single people, having a common origin, common modes of life, and, as an almost necessary consequence, common sympathies, if not a common and consolidated government. The traces of ancient fortifications in the northern part of the State of New York, and upon the head waters of the Susquehanna in Pennsylvania, may, it is believed, be referred with entire safety to the same hands with those of the Mississippi valley. It will be seen that they have a close resemblance to those of northern Ohio, both in position and structure. 28. These relics, as also the skeletons found with them, were probably those of the more recent Indians, and constituted a second and comparatively late deposit. The burned remains, doubtless, resulted from the original burial by fire. Incremation was extensively practised by the mound builders. 29. "There is a small enclosure on the south line of Franklin county, and another in Pickaway county, which closely resemble those along the lake shore." See Plate XIV, Nos. 1 and 2. 30. 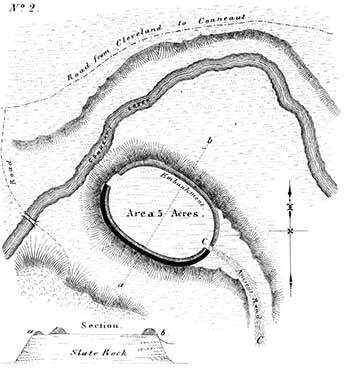 "The Ohio fortresses were not erected for defence against a casual invasion. The size of the walls, and the solidity of their construction, show that the danger which they were designed to arrest was of constant recurrence. "—Harrison's Discourse, Transactions Ohio Historical Society, vol. i. p. 263. 31. Charlevoix, Canada, vol. ii. p. 128; Loskiel, p. 53; Du Pratz, Louisiana, p. 375; Herrara, History of America, vol. v. p. 324. 32. Catlin's North American Indians, vol. i. p. 81; Lewis and Clark, ubi supra. 33. Travels in North America, pp. 173, 243. 34. De Solis, History of Mexico, p. 54; Juarros, History Guatemala, p. 462; Stephens's Yucatan, vol. i. pp. 165, 230; Molina, vol. ii. pp. 10, 68; Ulloa, vol. ii. p. 27. 35. Ellis's Polynesian Res. vol. i. pp. 313, 314; Cook's Second Voyage, ubi supra; Pollack's New Zealand, vol. ii. p. 26. 36. Charlevoix, History of Paraguay, vol. i. p. 156.